Dragon Spring Hotel (Longquan Jiudian) is a business hotel located on Longhua Renmin Zhonglu with easy access to several freeways, adjacent to most of the main golf courses in the city. There is a shuttle bus leaving the hotel for Hong Kong every hour between 7:30 a.m. and 6:20 p.m. everyday. The hotel is of Continental style. It offers a total of 133 guestrooms. Broadband Internet access is available in all the rooms on the business floor. The Wanfu Restaurant is a Chinese restaurant consisting of a hall and more than 30 VIP private dining rooms. Seafood and abalone are offered. A French restaurant is available in the lobby. 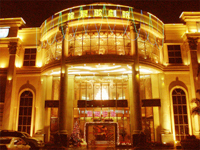 There is also a multifunctional banquet hall, a conference hall and a theater of Continental royal style.